World Cup Group H started with a bang for Japan when a Honda free Kick found Ōsako for the winning goal. The side got off to a dream start too in the match when Sánchez was sent off after three minutes for a handball in the box. The resulting penalty was scored by Kagawa. We talked before about the fact that it was hard to fit Kagawa and Honda into the same side. This was to be the case today as Nishino opted to start Kagawa. He then brought Honda on for Kagawa with 20 minutes remaining as both players played key roles in the victory. Honda's key role came on 73 minutes when his perfectly time corner was met by the head of Ōsako with the Köln forward heading home the winner. While the midfielder said on his corner kick afterwards "This was something that I was doing in training, Osako had been taken up good positions also, his positioning was truly amazing". The 32-year-old is no stranger to playing a part in World Cup goals too. 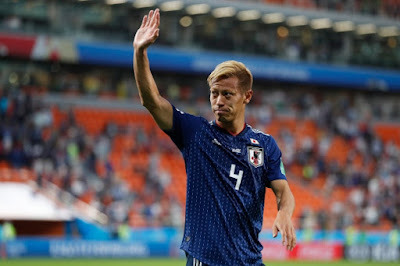 As the midfielder scored Japans first goals of the 2010 World Cup in South Africa and then the 2014 World Cup in Brazil. The player then although of course delighted with the win went on to talk about the tasks ahead as he said "We are all calm and happy right now. We have started well and dealt with the tension. I feel we can now progress throughput of the group and gather some real momentum." Confidence then appears to be high in the camp and hopefully, this will continue into the game against Senegal on Sunday.